ArcGIS Explorer is beginning to gain the interest of GIS users everywhere. Following the design form of popular consumer geospatial viewers, ArcGIS Explorer provides an easy-to-use way to view and share geographic services. Anyone can now download ArcGIS Explorer from www.esri.com/arcgisexplorer and start unlocking the power of geographic content and geographic analysis. The ArcGIS Explorer software is free, and freely distributable, making it a great way to share maps and GeoWeb services with others. The Notes task in ArcGIS Explorer offers an easy way to communicate geographically. Notes let users define a point, line, or area that can be associated with other information in a geographic context. Once users have downloaded ArcGIS Explorer, they can start using a variety of free maps and data layers available on ArcGIS Online. These maps and layers are provided by Esri free of charge and include imagery, topographic maps, physical features, shaded relief, street maps, and more. ArcGIS Online content can be easily combined with local data or with other Web services from different servers to create custom maps, which in turn can be easily shared with others. Esri just introduced a new content Resource Center. The Resource Center helps users find and utilize maps and layers; learn tips and tricks from the ArcGIS Explorer blog; participate in discussion forums; and share their maps with others. ArcGIS Explorer is ideally suited to situations where GIS users want a way to share data with people who are not GIS experts. A number of agencies have put ArcGIS Explorer on the desktops of virtually all their employeesproviding access and powerful visualization to their maps and GIS server functions. Users can integrate geospatial Web services from distributed map servers as well, or run any number of server-based GIS spatial analysis tasks as part of their integrated environment. Examples of simple tasks include Find Address, Find Place, Get Driving Directions, Create Notes, and more. Notes are particularly useful in a collaborative environment, since they offer an easy way to communicate geographically. They let users define a point, line, or area that can be associated with other information in a geographic context, such as photos, movies, documents, and links to other Web sites and resources. 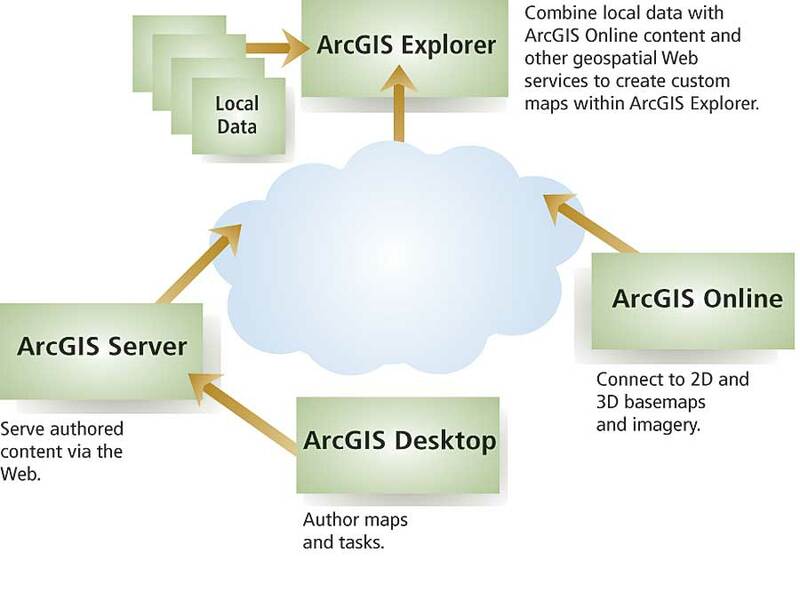 Since ArcGIS Explorer is part of the ArcGIS family of products, GIS users can extend ArcGIS Explorer by authoring their own content in ArcGIS Desktop, create services and tasks in ArcGIS Server, and sharing these with others via ArcGIS Explorer. A GIS user can also administer and customize ArcGIS Explorer locally, including customizing the Resource Center that is accessible from within the application. ArcGIS Explorer offers a software developer kit (SDK) that can be used to extend tasks or implement completely custom tasks that are driven by other Web services. 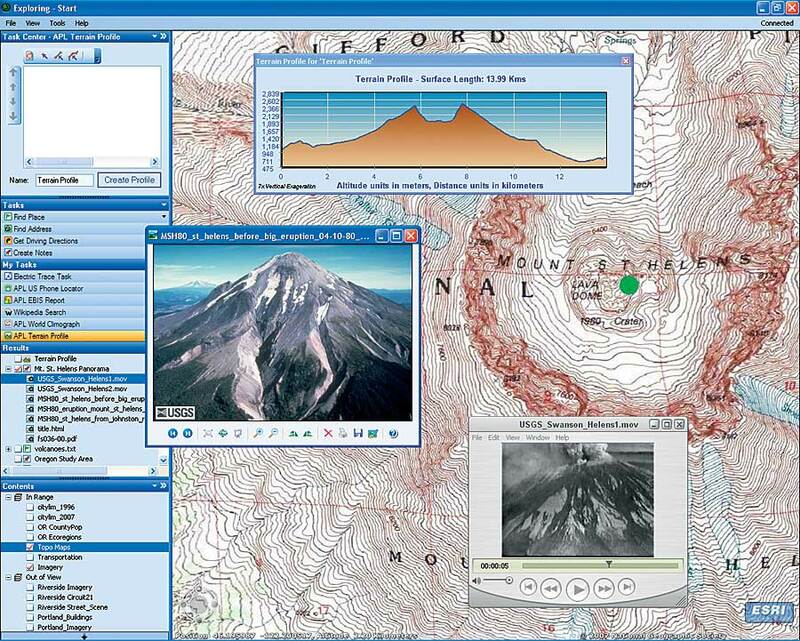 ArcGIS Explorer does not require any other Esri software product. For more information and to download ArcGIS Explorer, visit www.esri.com/arcgisexplorer.